I have always been fat. When I was in third grade, I dressed as Charlie Chaplin for Halloween, but everyone, including my teachers, thought I was dressed as Oliver Hardy. So, yeah, I’ve always been fat. I have always been an emotional eater, and there is no doubt I turned to food to provide comfort after he died. There have been times in my life when I have lost a lot of weight, but it never stayed off for very long. When my ten-year-old son, David, died eight years ago, the battle became much harder. I have always been an emotional eater, and there is no doubt I turned to food to provide comfort after he died. I reached my highest weight ever after his death. There was some up and down, but for the most part it was up. Our family has done very well in the wake of our loss; I started Healing Improv, a nonprofit that uses comedy improv workshops to help people struggling with grief, and I wrote a book about my experiences. I present nationally on the subject of grief with organizations like the Compassionate Friends. But my weight remained a problem. Just over a year ago my father died. He was eighty-nine and had led a wonderful life, so though it was sad, it was not totally unexpected. It certainly made more sense to me than my son’s death. Yet everything about that loss reminded me of losing David. All the things my father had taught me, and continued to teach me right up until his death, were things I would never be able to teach David. I went into a bit of a tailspin emotionally and of course took refuge again in food. I was angry with myself, full of self-hate, and I attempted to fill the emotional pit with pizza and ice cream. And then I saw a picture of myself at my father’s funeral. I was again near my highest weight. I was out of control. I had to do something. I realize now, though, that I need to put myself first. One of the things I stress to audiences is that helping others is a wonderful way to help yourself. I realize now, though, that I need to put myself first. I will never see David graduate from high school or get married, but I am determined to be around long enough to see his little sister, Abby, who had to endure losing her big brother, do all those things. This meant I had to finally come to terms with my weight. I have learned there are things in this world, like losing a loved one, that we cannot control. No matter what we do, some things we have no power over. But my weight is not one of those things. I spoke to my doctor about how I was struggling with my weight again in the wake of my father’s death, and that if I could simply stop eating, like a smoker stops smoking or an alcoholic stops drinking, it would be easier. He suggested I look into intermittent fasting. I had never heard of it, but after some research I decided to try the 5/2 eating plan: eating normally five days a week and micro fasting on two days. Apparently, it was how Jimmy Kimmel had gotten in shape. I also knew, though it was against my slothlike nature, that I had to find an exercise I could do and stick with consistently. I started walking. I started slowly, with just a mile a day. Long story short, I now walk every day at a brisk pace for three to five miles. I also have been very successful on the 5/2 plan, which allows me to feel like I am really only depriving myself two days a week instead of every day. 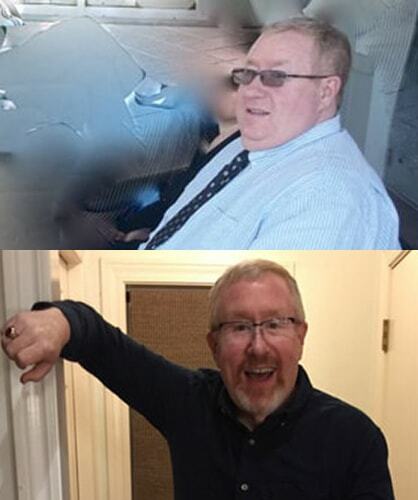 After a year, I have lost ninety-five pounds and weigh less today than I have since junior high school, more than thirty-five years ago. None of this is a guarantee that I will be here to see all the things in my daughter’s life I want to share with her. It’s no guarantee my wife and I will live to enjoy sixty plus years of marriage as my mom and dad did. But what it has taught me is that in the battle with grief—and make no mistake, grief is something we must battle—it is empowering to take control of those things we can. Grief happens. Choosing to battle to find a new normal is essential. Helping others who are new to grief, or with any struggle, can help us regain purpose and direction after a loss, often in new ways. But respecting yourself and taking control of those things that are in your ability to control is powerful. It gives you a feeling of accomplishment. May you find your strength. Peace, light, and laughter.